When I research Boston's transit history, I do so using original primary sources. My most-used source is Boston's ward maps.com, where there are many old maps of Boston dating back hundreds of years to be found. 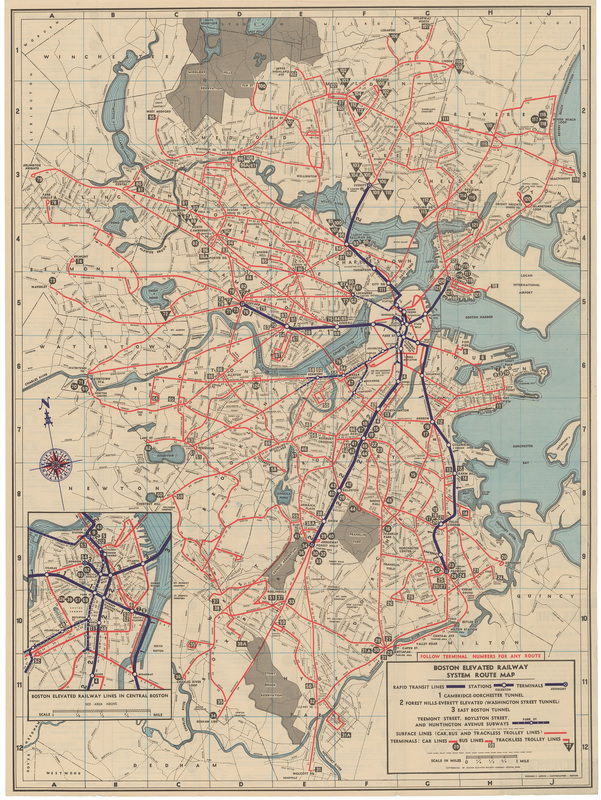 Maps include old transit maps from the Boston Elevated Railway (BERy), MTA and MBTA, as well as fire insurance maps, such as Bromley Maps, that say where certain buildings once stood and what businesses occupied them. 1946 BERy route map, courtesy Ward Maps. Bromley map of East Cambridge in 1930, courtesy Ward Maps. Using these maps, and by comparing earlier maps to later ones, I deduce what parts of Boston once looked like and how they changed over time. From there, I use my knowledge of the trends of change in Boston over time to conclude why such changes have take place and what factors have brought forth such changes. 1884 Bromley map of Mattapan Square. At this time, there is no streetcar service along Blue Hill Avenue connecting Mattapan with Dudley Square and downtown Boston; therefore, Mattapan Square, the southernmost tip of Boston, is an impractical place to live at this time. However, there is NY NH & H RR train service to Mattapan Square proper, which has evidently spurred commercial development in the area. 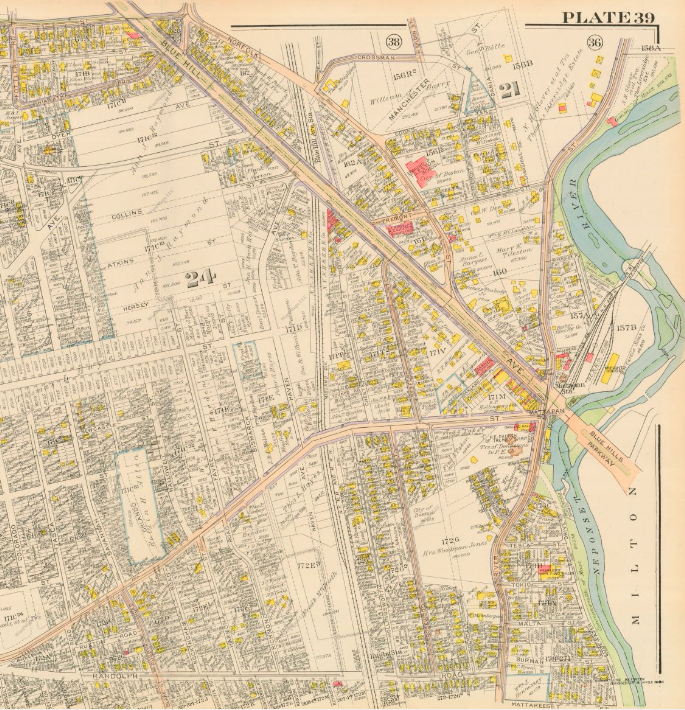 1918 Bromley map of Mattapan Square. At this point, the 29/Mattapan-Egleston streetcar has run along Blue Hill Avenue for upwards of ten years, connecting Mattapan Square with Egleston Square and the Washington Street Elevated and giving area residents a convenient, reliable and affordable link to downtown Boston. Accordingly, there has been unprecedented commercial and residential development in the area, as it is now a very attractive place to live and work. Note that the majority of the development has taken place immediately around Blue Hill Avenue, as that is where the streetcar stops. 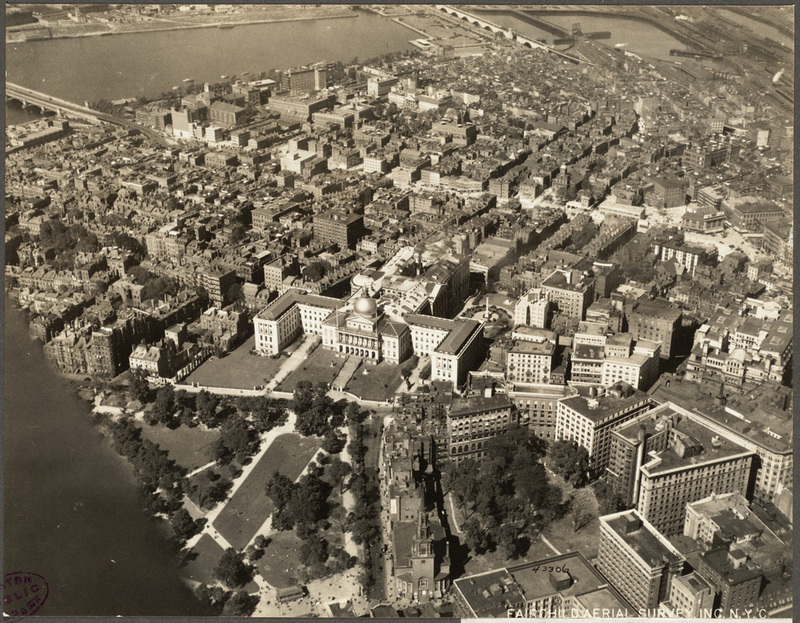 1925 view of Beacon Hill and the West End, courtesy Boston Public Library. As you can see, the West End is a thriving neighborhood at this time, with many buildings packed along a very narrow street grid,. 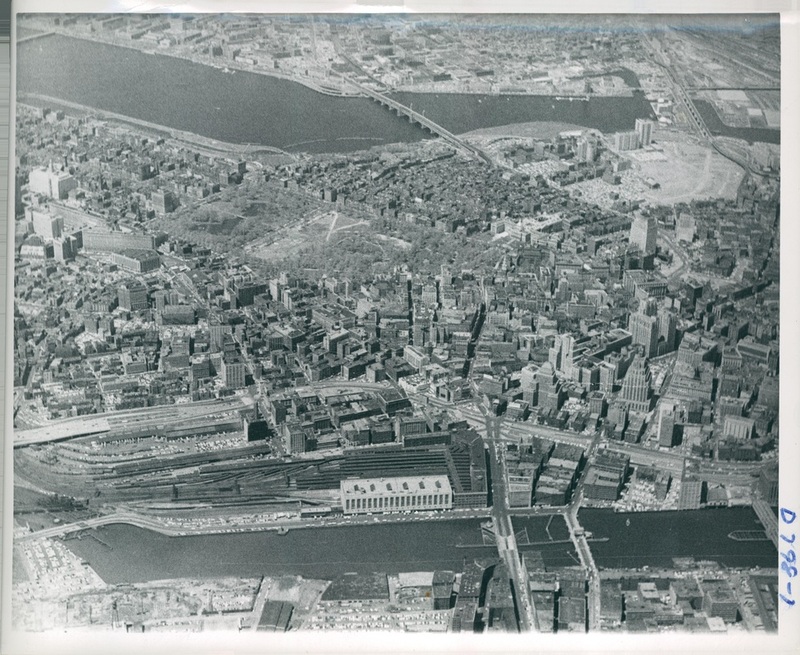 Early 1960s aerial view of Boston, courtesy City of Boston Archives. As you can see in the top right corner, the West End has been almost completely demolished as part of the West End Urban Redevelopment scheme. Google Street View of the intersection of Blue Hill Avenue and American Legion Highway in Dorchester today. As you can see, there is no trolley infrastructure whatsoever in this area—both trolley lines that once ran through (22 and 29) have since been bustituted. 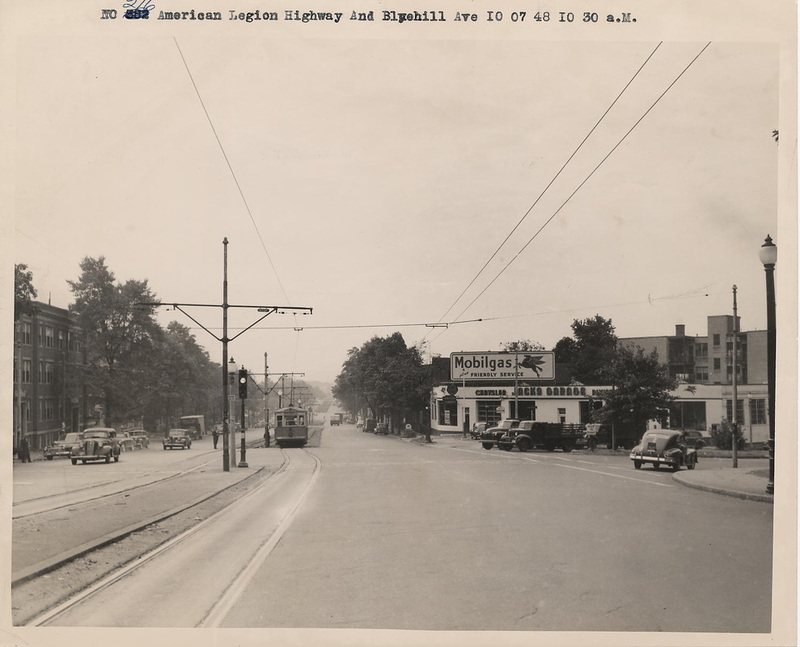 Same intersection in 1948, back when the Route 22 trackless trolley ran on the side of the street (note trackless trolley double wire) and the Route 29 streetcar ran in the center of the street (note tracks, wires and stopped Type Five streetcar). Image courtesy City of Boston Archives. Much of my research is also done by consulting with knowledgable Boston residents and their publications. Bradley Clarke's "Streetcar Lines of the Hub" has proven to be an excellent resource that comes in great handy whenever I need to check up on where streetcar lines once ran—the book is laden with track maps, route descriptions and old photographs. Whenever I have a question about the timeline of Boston transit—e.g. when a certain streetcar line stopped running, when a certain type of streetcar entered service—or am in need of a fact clarification—e.g. what specific features Boston's streetcars had over time, what remnants of streetcar lines have been found around the city over the years—I turn to individuals who have lived in Boston for much longer than I have and have experienced such change firsthand. I would like to take this opportunity to thank Gerard O'Regan and John Kyper, both of whom are always willing to answer any questions or clarifications I have about the history of Boston Transit!